Waveguides offer an ideal medium for the high frequency and high power signal transmission seen in radar and aerospace defense applications. The high transmit powers needed in these applications effectively factor out the usability of coaxial cables or most other high frequency transmission lines. From antenna feeds to test laboratories, waveguide routing is nearly always subject to the trade-off of perfect flange alignment and space constraints where the traditionally leveraged rigid waveguides can limit routing options. Flexible waveguides offer a potential solution to these scenarios as they can be adjusted torsionally or flexed laterally in order to couple with other waveguide flanges without distorting the mode of the signal. More often than not, RF engineers utilize coaxes and these cables have the distinct advantage of flexibility and a wide bandwidth. For radar applications, or any high powered and high frequency system, the main issue with the coax is the decrease in cable diameter with respect to frequency—it limits the amount of power that the cable can handle. The dimensional requirements of waveguides are much less restrictive. On the contrary, instead of a wide operational bandwidth, waveguides have a distinct lower cutoff frequency and upper frequency limit for single mode operation. Moreover, waveguides have the advantage of a much lower signal loss over the medium. In terms of flexibility, waveguides can also either be bent laterally or twisted torsionally along the direction of signal propagation, not both at the same time like a coax. Routing is therefore a significant consideration in waveguide installations. The difference between these two frequently used mediums for transmission can be better illuminated by highlighting the difference in their signal propagation. Modes can be loosely defined as the distribution of electric and magnetic fields across the cross section of the waveguide. Coaxial cables enable transverse electromagnetic mode (TEM); this mode allows a signal to propagate through the medium with no electric field or magnetic field in the direction of propagation. In other words, the E- and H-fields are perpendicular to each other in free space. This type of mode allows for relatively seamless signal propagation with a constant characteristic impedance and velocity of propagation without the risk of dispersion or distortion. The inherent attenuation in coaxes is then simply a product of the resistive or dielectric losses in the conductor and insulative materials used. Aged cables that have been subject to moisture/chemical ingress or flexing experience signal degradation due to abrupt changes in the cross-sectional dimensions (a.k.a. impedance mismatches) that causes reflections and therefore, signal loss. A waveguide, however, operates in either transverse electric (TE) or transverse magnetic (TM) mode. In TE mode, the electric field is transverse to the direction of propagation while the magnetic field is perpendicular. In TM mode, the magnetic field is transverse of propagation while the electric field is perpendicular. Depending on the frequency of the transmitted signal and dimensions of the waveguide, various modes can be introduced, each of which propagates at different velocities along its longitudinal axis. As follows, it would be difficult to discern which mode carries the transmitted signal in a waveguide carrying several modes causing signal dispersion or distortion. Moreover, different mode structures can also create reflections at the coupling point between waveguides regardless of whether the waveguides have the same characteristic impedance. Bends and twists in the waveguide just add another variable in the introduction of unwanted modes. Signal propagation can also diminish rapidly when flanges are misaligned, an issue that could appear when one is limited in routing space. As stated earlier, in order for a signal to propagate through a waveguide without reflections, the cross-sectional dimensions and dielectric material must remain constant. There are a few select ways to bend or twist a waveguide that does not cause reflections. Gradual bends such as E-bends or H-bends must have a bend radius greater than two wavelengths to avoid reflections (Figure 1). A waveguide twist can also be employed in order to rotate the electromagnetic field to match with the phase of the load. The span of the twist must also be greater than two wavelengths to minimize losses. 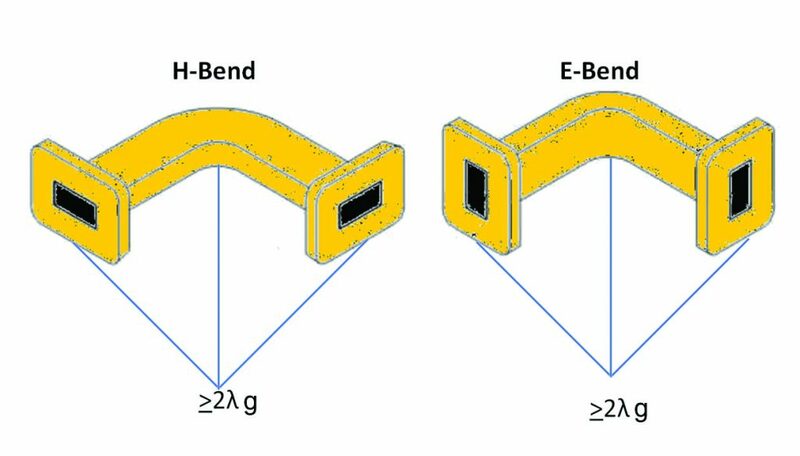 Flexible waveguides can be bent along the H-plane, E-plane, twisted (90º or 45º), or all three. The flexible waveguide can therefore be used in a pinch when re-adjusting a waveguide installation, but the internal formation causes reflections and some significant power losses. The slight, but abrupt changes in the internal dimensions of the waveguide cause a squeezing of the internal electric field or magnetic field—this is especially true for the corrugated, bellows-like flexible waveguide. A change in height on the broad wall (H-plane) is equivalent to the insertion of inductance, while a change in height on the narrow wall (E-plane) is equivalent to the insertion of capacitance . For the unsoldered interlocked flexible waveguide, the internal and external interlocked parts are not entirely shielded, leading to the potential leakage of electromagnetic energy. One benefit of a flexible waveguide over a rigid waveguide not often considered is the weight reduction; the brass-tape leveraged in bendable waveguides is significantly thinner, and therefore lighter, than what is used in rigid ones. While this may not be a major consideration for ground-based defense stations, it is for satellites, where every kilogram matters at launch. Waveguide installations also do not typically allow last minute alterations. As a matter of fact, outside of laboratory environments, much waveguide routing is preplanned with rigid waveguides preformed to match the length and dimensional requirements needed. Nonetheless, there are changes that may occur, for example, in an antenna feed in the transmit chain of a defense radar system where flexible waveguides would be a pretty ideal component. Previously, we briefly covered the construction of flexible waveguides along with various types of rigid waveguides (bends, mitered edges, and corners). While avoiding redundancies, this subsection aims to provide more technical depth on the manufacture and build of a flexible waveguide. 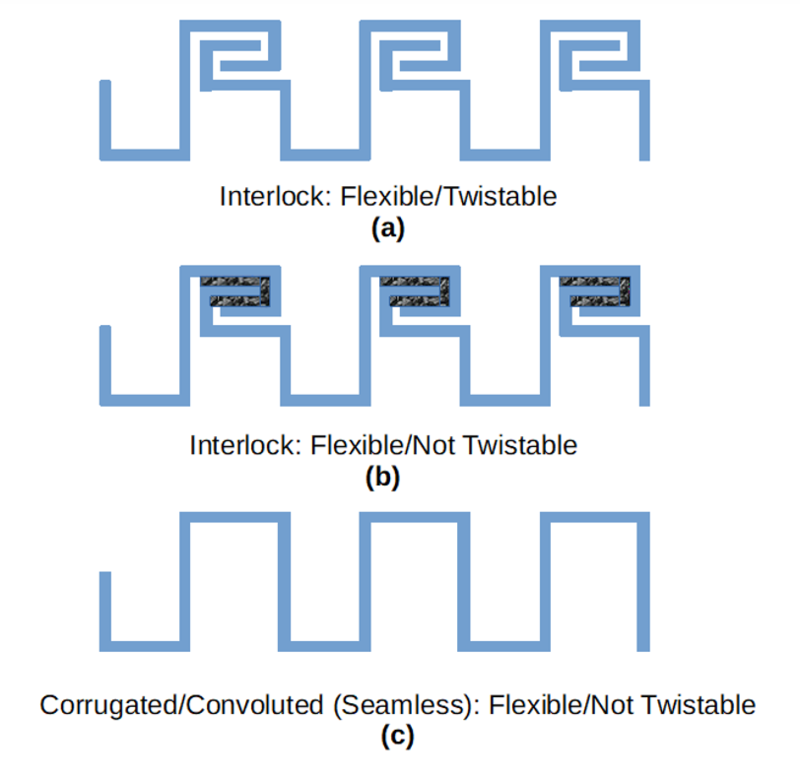 A flexible waveguide can fall into one of two categories: both flexible and twistable or flexible but not twistable. There are, however, many different ways to accomplish this. One method of achieving flexibility is from a corrugated tube that is also known as a seamless waveguide—this is likely due to the fact that the interlocked formation has periodic seams at every link. One method of manufacturing a seamless waveguidesinvolves corrugating a brass plate and then folding that to make a waveguide of requisite dimensions. The seam is then soldered, flanges brazed on, and the rubber jacket is put on. This method naturally is prone to deformities and often the inability to meet the tight dimensional requirements of millimeter-Wave waveguides. Another method involves shaping thin-wall rectangular tubing. As shown in Figure 3, the interlock can be accomplished a number of ways. It can be left bare for both a twistable and flexible waveguide, but this does increase the risk of leaking energy. In these cases, it is recommended that they be jacketed with neoprene or rubber so that they can be pressurized. In some cases, the brass tape is plated with silver prior to winding so that the contact resistance within the interlock is reduced, thereby achieving improved electrical contact. The interlock can also be soldered for a flexible but non-twistable waveguide. The interlock waveguide is known to be the most rugged and stable type of flexible waveguide. Figure 3: Various types of interlocks including one (a) without solder and one (b) with solder. Corrugated (bellow-like) flexible waveguides allow for flexing but no twisting. There are a wide variety of manufacturing techniques which include variations in plating, jacketing materials, and interlock types. This makes it next to impossible to manage the stretch, twist, and center-line displacement ranges for a particular flexible waveguide . Oftentimes flexible waveguides will specify a one-time bend minimum radius as well as a repeated minimum bend radius on the manufacturer’s datasheet. Repeated bending beyond the specified bend radius can subject the waveguide to cracking and various damages that could severely degrade performance. Slight damage to the inner surface of the waveguide will cause standing waves and, in high powered applications, internal arcing that often exacerbates the damage to the waveguide, rendering it nonfunctional. In naval applications, for instance, moisture is a looming threat where water is a poor dielectric that often exacerbates the risk of electrical arcing. From prototyping to major antenna installations, the flexible waveguide offers a solution to tight waveguide routing scenarios. Assisting with installation problems caused by misalignment, these flexible/twistable waveguides come in a variety of form factors, corrugated (seamless) to interlocked. The choice of waveguide depends upon a variety of factors including bandwidth, length, type of bend (E- or H-bend), type of twist, and bend input power/peak power. 1. Microwave Engineering Concepts and Fundamentals. CRC Pr I Llc, 2017. 2. Elwyn, Van Valkenburg Mac, and Middleton, Wendy M. Reference Data for Engineers: Radio, Electronics, Computers and Communications. Newnes, 2002.